CBN.com  I had just dropped off my daughter at preschool and was driving home with my other two children when I turned the radio on and discovered that the world as we knew it was suddenly turned upside down. It was September 11, 2001. Live on the radio was a gentleman in Manhattan describing what he saw when the first World Trade Center exploded in flames. He spent time speculating whether it had been a bomb or a plane somehow veering off course by mistake. Less than a minute later, that same observer saw the second plane fly directly into the second World Trade Center, and suddenly my heart sank as I realized we were under attack. I switched the radio dials as fast as I could so that the sound was only coming from the speaker in the front left, closest to me. I wanted to make sure that my children didn’t hear what was going on. I kept on driving, keeping my eyes on the road, mesmerized by what was happening. We got home, and I sat the kids down for a VeggieTales movie in the family room as I spent my time in the kitchen listening to the radio and trying to figure out what had happened. I was sorting through my own fears. Should I pick my daughter up from preschool and bring her home? Were there going to be other attacks? Were we safe in Ohio? Five years have passed since that terrible morning in September, and I still have more questions than answers. We were all changed by those horrific events, some much more than others. My oldest daughter, Hannah, was only 5 years old back then, yet she has many memories of those events. On September 12, 2001, Hannah drew a picture of two planes flying into two buildings, with flames and smoke coming out. I didn’t even realize she was aware of all the details. I didn’t even know that she had her own fears about the attack. Yet here she was, speaking to me in the form of a picture, asking me to tell her she was safe, and looking for assurances that I didn’t even know she needed. It was a wake-up call to me, a moment in time when I realized that I could not shelter my children from all the evil in this world. What I was called to do as their mom was to talk to them about the terrorist attacks on their level, to make sure they knew that they were safe, and to listen to their hearts. Five years later, my calling is still the same and my task is just as difficult. Children see the world differently than adults do. Their perspective is much closer to home. They want to know specifically how the anniversary of 9/11 impacts them. They wonder, Am I safe? Will it happen again? Should I be afraid? Can I trust God? The number-one priority for parents is to make sure that their children feel safe. It all starts with talking to your kids, on their level, and meeting their needs. Open the door – Begin by simply opening up the door of communication. Ask your children if they were aware that the five-year anniversary of 9/11 is here. Ask them how they feel and respect their feelings, whatever they are. Share your own feelings – Share your own feelings, emphasizing how you cope with your own fears. When you are scared, you talk to someone you love. When you feel alone, you pray. Whatever helps you will help your kids, too. Emphasize their safety – Discuss how our government has changed airport security and sent our brave soldiers overseas to protect us, that there are many, many people in the world who are good, who are protecting us. Reassure your children that they are safe; that is the most important thing you can do. Turn the TV and radio news off – Turn the news off when kids are around. Do not over expose them to graphic and horrific details of 9/11. Protect their minds from seeing that violence and reliving the horror. 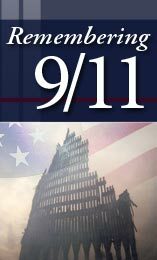 Realize that kids talk - As much as you might protect your children from watching the news or listening to radio programs on 9/11, their friends might be viewing that material and will probably share their experiences and fears with your kids. Kids talk. That’s a fact of life. So don’t hide your head in the sand. Talk to your kids in terms they will understand. Turn to God – Now is the time to turn to God’s Word. Share God’s plan for your child’s life. Remind your child of God’s love for him or her. Jeremiah 29:11 says, “For I know the plans I have for you,” says the Lord, “plans to prosper you and not to harm you, plans to give you hope and a future.” Remind your children that God is in control and that God is with them. Pray – Together, pray with your child about his or her fears, and ask God to grant your child peace. Also ask God to be with the families of the victims of 9/11, who are feeling more pain than we can imagine. Pray for our soldiers overseas and their families back home. Re-focus your child on the positive impact their prayers can have on so many people, so many lives. Answer their questions – Kids have questions, even if they don’t ask them out loud. Be prepared with your answers and keep the lines of communication open. Last night, I decided to take my own advice and talk to my kids about the upcoming 9/11 anniversary. I began our journey together by going up to the attic and digging through my boxes to find the picture Hannah drew five years ago of the planes crashing into the World Trade Center. I was suddenly thankful that I had kept their artwork, and I realized what a precious piece of their past it was. I had forgotten what it actually looked like, how tiny her fingers must have been, how young she was back then. I found it among hundreds of finger-painted rainbows, turkeys made from handprints, and flowers in every shape and size. When I found it, my heart beat fast. I had forgotten how beautiful it was. Hannah had colored the two buildings bright pink and had placed an American flag on top of one. There were two planes flying into the buildings, and flames and smoke just as I had remembered it. But she had also drawn a beautiful green tree in between the two buildings, separating the devastation with life. She drew two bright red hearts just above them, showering them with love. Suddenly, it all made sense. Even though she saw the horror of evil on that fateful fall day five years ago, she had also found some beauty there. Somehow, in her little girl mind, in her own little girl way she was able to see something beautiful out of the September 11 tragedy. Kids are brighter than we expect them to be, more tuned in to what is going on than we realize. With all the horror of that day, there were also thousands of everyday heroes, men and women who gave their all to rescue others; there were people who found the Lord in dark stair wells, and on planes; and there were families who drew closer together and closer to Christ. Hannah’s picture was a needed reminder that as the fifth anniversary of 9/11 approaches, we all need to talk to our kids about that cool day in autumn when terror met love. Trish Berg has been married for nearly 15 years and has four children ranging in age from 11 to 3. She is a regular feature writer for MOMSense Magazine and P31 WOMAN, Proverbs 31 Ministry and a monthly columnist for InspiredParenting.net. She is also a member of the Christian Writer’s Guild. Her upcoming books, Rattled: Surviving Your Baby’s First Year Without Losing Your Cool (Multnomah) and The Great American Supper Swap (Cook), are due to release in 2007. To learn more, visit her Web site, www.trishberg.com.